Lemongrass and kaffir lime leaves can be found at Asian supermarkets. If you can't find it, substitute a teaspoon of lime zest, although the flavor won't be the same. Heat 1/2 cup coconut milk in a small saucepan over medium heat. Cook until it bubbles and thickens; add red curry paste and cook for another minute or two, mixing it in well with the coconut milk. 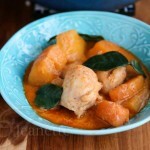 Add rest of coconut milk, fish sauce, chicken broth, sugar, lemongrass, lime leaves, chicken and squash. Bring to a boil, then reduce heat to low and cook until chicken is cooked through and squash is tender, about 25 minutes.